Action from FC Peterborough's 4-2 win over Parkway Eagles (red). Photo: David Lowndes. AFC Stanground Sports have defended their decision to stop playing their Peterborough Premier Division game at Sutton Bridge United at half-time on Saturday (October 28). Depleted Stanground were 10-0 down at the time after starting the game with nine men. Two injuries in the first-half persuaded manager Rob Ames to call a halt to save his remaining players from further punishment. 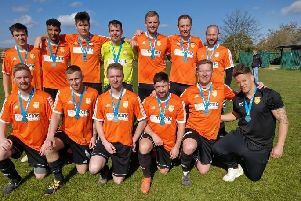 Parkway Eagles before their 4-2 defeat at FC Peterborough, back row, left to right, Tom Jacombs , Joe Dobson, Andrew Fowler, Neil Kirkman, Dan Rice, Conor Barton, Luke Smith, front, Stevie Snelling, Kieran Luxford, James Savage, Tom Lancaster, Stuart Lee, Glenn Longden. Photo: David Lowndes. “We didn’t actually walk off,” Ames claimed. “We started with nine men and after 10 minutes Cain Roberts suffered a hamstring injury. Then my centre-back ripped his finger open which left us with seven players for the second half. Stanground now face a fine and a points deduction. Matches are automatically abandoned when teams are reduced to six players. Matthew Eaton (5) and Jake Lally (3) had enjoyed a fruitful goalscoring 45 minutes for Sutton Bridge. Bottom club Langtoft United were also short of players for their home match with in-form reigning champions Peterborough Sports Reserves, but they battled gamely for 90 minutes. AFC Stanground Sports manager Rob Ames. In fact it was only 2-0 with 20 minutes to go before tiredness set in. Tom Flatters (3), Lewis McManus (2), Dylan Kilford and Jordan Giddings scored for a Sports team who were winning for the eighth top-flight game in a row. Sports are second, two points behind leaders Moulton Harrox who dropped points for just the second time this season when held 2-2 by Whittlesey Athletic at Broad Lane. Jack Carter scored twice for Whittlesey who will surely climb the table once they complete their many games in hand. Louis Steadman and Billy King scored for Harrox. Stamford Lions are third, but with four games in hand on Sports. They made it nine Premier Division wins in a row with a 5-0 duffing of Deeping Rangers Reserves. Tom Edwards opened the scoring in the first minute before Luke Ball (2), Rob Forster and Tom Lees scored further goals. Matthew Brown bagged a hat-trick for Warboys, but it was a great team performance that led to a 6-0 win over Ketton, while Nathan Glover and Scott Spearink both scored twice as ICA Sports beat Holbeach United Reserves 5-1. Netherton gained revenge for their sole Premier Division defeat of the season at Leverington by crushing the same opponents 6-0 in PFA Senior Cup tie. Zak Fisher struck a hat-trick with Ondre Odain (2) and Tom Randall also on target. The big city derbies in Division Three between Feeder and Premiar, and Cardea and Brotherhood Sports finished all square, while FC Peterborough continued their fine start in their first season in Division Two with a 4-2 win over city rivals Parkway Eagles. Premier Division: Langtoft Utd 0, Peterborough Sports Res 7 (Flatters 3, McManus 2, Kilford, Giddings); Moulton Harrox 2 (Steadman, King), Whittlesey Athletic 2 (Carter 2); ICA Sports 5 (N. Glover 2, Spearink 2, Cross), Holbeach United Res 1; Stamford Lions 5 (Ball 2, Edwards, Forster, Lees), Deeping Rangers Res 0; Sutton Bridge United 10 (Eaton 5, Lally 3, English, Cooper), AFC Stanground Sports 0 (abandoned at half-time); Thorney 5 (Fox 4, Edwards), Sawtry 1 (B. Smith); Warboys Town 6 (Brown 3, Moulds 2, Thornton), Ketton 0. PFA Senior Cup: Leverington Sports 0, Netherton United 6 (Fisher 3, Odain 2, Randall).